United4all has largest fleet of SNG and OB satellite trucks in Holland. Hilversum, May 2017: The broadcast services company, United - which has the largest fleet of Outside Broadcast vehicles and satellite trucks in the Netherlands - is offering a very flexible workflow to ENG crews. New to promoting its services on TVZ, United - in partnership with Mobile Viewpoint - supplies broadcast teams with a system called Connected Camera. This consists of a box attached to the camera which pushes the video images towards the postproduction platform. Right after the camera starts rolling, the content arrives in low resolution in the post production facilities of United in Hilversum. The edit can start immediately while the crew is still filming on location. After the edit, the relevant high-resolution content is automatically retrieved from the camera which is still on location. The low-res images on the editing timeline are then automatically replaced by the high-resolution images. Content arrives over the internet: 3G/4G, Wifi or LAN, or all of them combined for even faster turnaround. 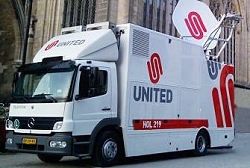 United, which is part of the Euro Media Group, has a large selection of OBVs (Outside Broadcast Vehicles), SNG satellite trucks and mobile editing facilities. Its teams and production vans cover a wide range of events for clients ranging from news, webcasts, daily talk shows to big live events such as the Olympics.